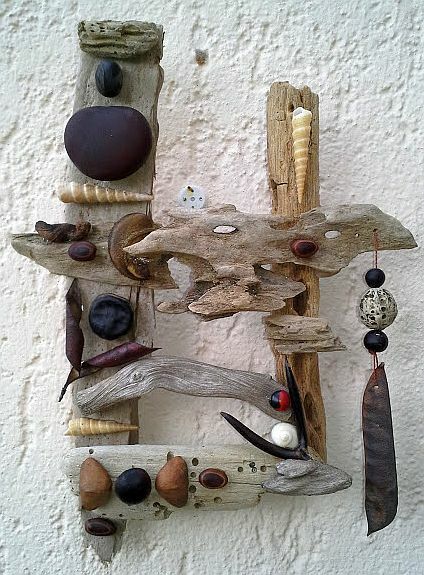 Driftwood and Sea Bean Wall Collage. With Sea Heart (Entada giga), small round Entada polystachia seeds, gray Nickernuts, wide banded Ox Eye (Mucuna), Mary’s bean, Guanacaste Tree seeds, Sea Purse (Dioclea reflexa), Poinciana seeds, one Sandbox Tree seed, and Terebra turritella sea shells. Invitation: Stay close to your friends and loved ones. Connect from the heart. Know that you belong. 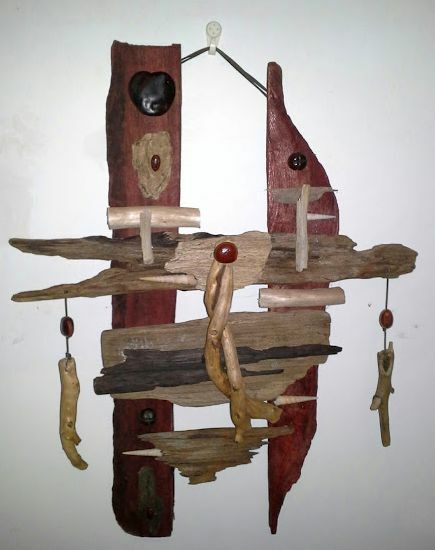 “Connections.” Driftwood and Sea Bean Wall Collage. With Sea Heart (Entada giga), small round Entada polystachia seeds, gray Nickernuts, wide banded Ox Eye (Mucuna), Mary’s bean, Guanacaste Tree seeds, Sea Purse (Dioclea reflexa), Poinciana seeds, one Sandbox Tree seed, and Terebra turritella sea shells. I am no longer selling my driftwood collages. I simply wish to share them with you. I hope you enjoy their natural beauty. This piece took several days. Lots of selecting, rejecting, selecting, placing of different pieces. When it came time to glue it together and screw it together, I decided to change the background cross pieces. Everything changed! I had to add pieces spontaneously. Then, the next day I added more. The center piece is a strangler fig I believe. It is quite interesting. The bottom left small piece of driftwood is quite nice. Starnut Palm Seed, Two Copaferia pods “Antidote Vine” pod (Fevillea Cordifolia), upon which I placed a white river rock. Small black round sea beans.Pterocarpus marsupium (or santalinus). Pods from a the Mexican Bird of Paradise Tree. Invitation: Hug the ones you love. Celebrate diversity. Drift seed and shell collage on flat driftwood. Turritella shell, Sea Heart (Entada giga) sea peas, Malinche tree seeds, Guanacaste Tree Seeds, Jobo tree seed, Mucuna Holtonii, sea grape, two unknown, Sea Purse (Dioclea reflexa), and an Acacia Tree thorn. Invitation: Stay on the path, though it winds around unknowns. Enjoy the journey. Find your home. Love Me Two Times. Drift Seed Wall Collage. A beautiful piece, gently balanced with soft colors to create a visual reminder of loving relationships. Tears of Saint Peter seeds, Guanacaste Tree Seeds, Mexcian Bird of Paradise Tree Pod, Sea Purse, Sea Peas, sea shells, Turritella shells, Gray Nickernuts, Malinche Tree seeds. Invitation: Connect with your inner and outer lover/beloved. Appreciate your friends. Be a best friend. 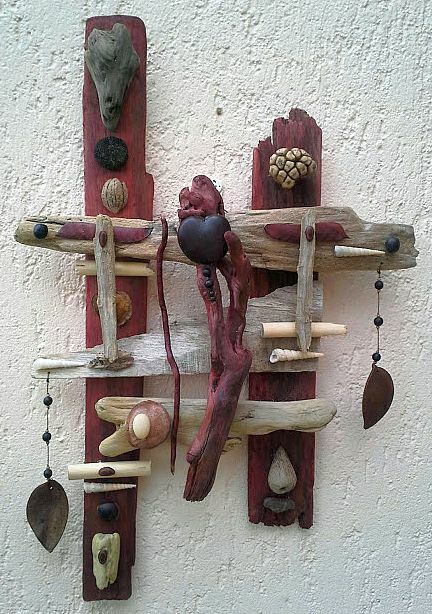 This is in the original “Cross” style of my first piece and of “Family Tradition:” stained flat driftwood with interesting cross pieces. It has been sold, by I can make you a similar one based on the seeds I have. Seeds: Sea Purse (Dioclea Reflexa), Sea Heart (Entada Giga), Jamaica Walnuts, P. copaifera pod, lovely black Oxy seeds (Oxyrhynchus trinervius), Acacia Tree thorns, Mexican Bird of Paradise pods, Turitella shells, and Manicheel sea beans. Invitation: Keep your eye on your goal even when things get complicated. Hold yourself kindly. A smaller driftwood collage that reminds us to be kind to our sensitive places inside. This can only be sold in Costa Rica because it is too fragile to ship. Sea grape, Sea Heart, Sandbox Tree seed, Guanacaste Tree seed, Mucuna Holtonii, Oleander Tree seeds, and a lovely seed full of holes, type unknown (hanging with a Mexican Bird of Paradise Tree pod). Invitation: Allow yourself and others to be sensitive, vulnerable, and real. Connect authentically. Hold yourself kindly. 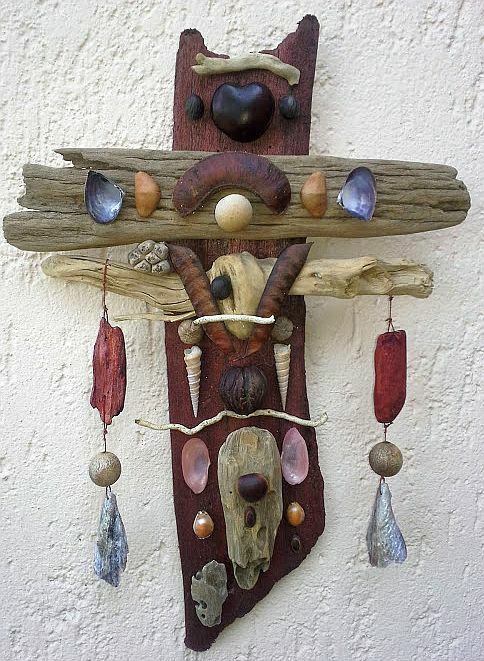 This collage shows off the beauty of driftwood. It is truly spectacular. Seeds: Acacia Tree thorn, Sea Heart (Entada giga), Mucuna holtonii, Sea Peas, Guanacaste Tree seeds, P. copaifera, gray nickernut, lovely Oxy seeds, one small sea grape, and gorgeous driftwood. The sand dollar was a gift from a friend in New York. Invitation: Embrace both your shadow and your light. Let your heart be your source of balance. Sea Heart, the lovely black (tropical) walnut, Oleander tree seeds, unknown pod, little black sea grapes, a sea purse, Guanacaste Tree seeds, Screw Pine, and Manicheel Seeds (whole and dry). Pods from the Mexican Bird of Paradise tree. Shells are mostly from Costa Rica’s pacific coast. Invitation: Seek emotional balance and enjoy your friends and companions. Let yourself be loved. 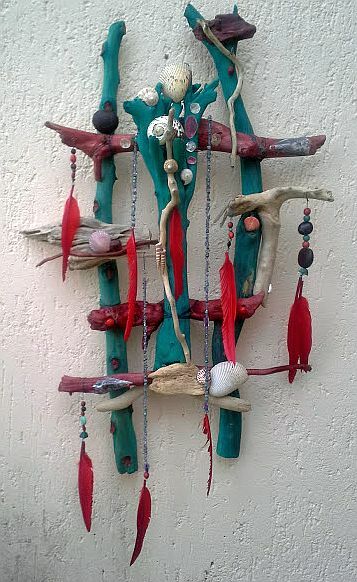 A colorful wall sculpture with mostly shells, feathers, and beaded dangles. The center shell is gorgeous. Invitation: Sing your song. Be real.